Fleas are common throughout our region. They thrive on a warm humid climate therefore are often seen during the summer months. They are found living on cats or dogs (be it the family pets or visiting animals). However, even if you don’t have pets, fleas from the external environment can quickly jump onto a host or latch onto clothing and are carried into your home leaving them free to begin the process of migrating onto everything. •	Adult fleas feed on blood, and when hungry will feed on the first warm-blooded animal or human that they come into contact with. •	After feasting the female lays her eggs on the host and eggs fall to the ground or on an animal’s bedding. •	Eggs hatch into larvae, and burrow under pet bedding or into carpet feasting on the hair and old skin shed from your pet. •	New adults emerge from pupae; triggered by subtle vibrations like footsteps. •	Adults may survive a year or more, dependent upon being able to periodically feed. •	Flea bites can result in an allergic reaction for some humans and animals. Their bites are itchy, red, raised, sometimes painful, lumps and are clearly visible on humans. If you, or your pet have been absent from the home for a length of time, or your pet has been in boarding facilities monitor how often your pet scratches. This simple observation may be the first way of identifying a flea infestation. You can begin removing fleas from your animals by using a special flea comb and/or applying flea treatments but this will not solve the problem. This is because fleas actually spend up to 90% of their life cycle off your pet and in the carpet and/or in your furniture as immature larvae or pupae. Having a vacuum cleaner that has a beating action head is a good step towards maintaining flea control, cleansing your carpet of immature fleas. All flea infestations will require a multifaceted two staged treatment plan, as the methods and treatments used to kill adult fleas are ineffective against killing flea pupae and eggs. This is where we use non-toxic insect growth regulators to break the flea life cycle and ensure there is no re-infestation of the problem. One of our first steps is to ensure your pet’s flea problems are controlled, and only then can we go on to treat the rest of your home. Because fleas are difficult to eradicate, working in partnership with you is the best way to ensure fleas are not accidentally reintroduced after we have eradicated them. 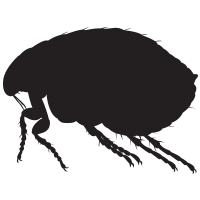 To do the job right don’t hesitate, contact us at Nature’s Way and we will assess and treat all flea infestations.